In 2003, JD Weisbrot and his brother, Michael, opened a small, surety bond agency in a modest 600 square-foot office — just enough space to fit two people! 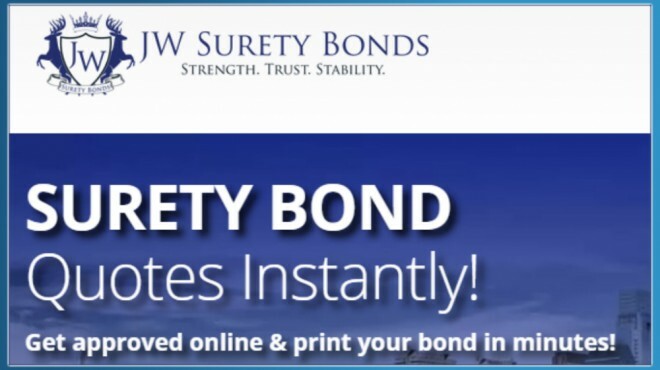 A year later, their business, JW Bond Consultants, Inc., became the first agency to approve bonds online, directly on their website. By 2009, they were the largest volume producer of surety bonds nationwide thanks to instant, online approval, and the rest, as they say, is history. Along the way, JD learned some valuable lessons in what to do — and what not to do — as an e-Bond pioneer. I recently talked with JD about his experience starting a business, how the business has grown and changed over the last 13 years, and what advice he’d give other finance entrepreneurs and small business owners. His insights into business management and marketing are valuable for all small business owners, whether your business is focused on finance or another B2B service. As the first surety bond agency to approve bonds online, JD and his team have always been on the cutting edge of what’s next. But as any small business owner knows, simply having a good idea is not enough to guarantee its successful execution. JD follows a disciplined process for idea implementation. “We believe any idea that’s worth doing is worth doing right,” says JD. “Whether we are introducing a new marketing strategy or internal process overhaul, we follow a clear process for implementation, measurement, feedback and improvement. JD understands that idea execution is the real test for innovation success. Strategy, process, structure and capability are as important as the idea itself. Establish a clear feedback loop for measuring effectiveness and implementing iterative change. Failure is to be expected: if something fails, be ready to learn, adjust, adapt and pivot. In the last decade, the productivity of mid to large-sized businesses has multiplied thanks to big data and SaaS applications. Only in the last few years have small businesses started getting on board with SaaS for data visualization, analytics, and automation. Small business owners take note: software automation is beneficial for everything from cultivating leads to up-selling existing customers. It’s hard not to be inspired by JD’s journey. JW Bond Consultants, Inc. has grown from a small, two-man business to the largest volume producer of surety bonds nationwide. He’s spot on with his advice, too: have a clear plan to implement new ideas/manage failure, streamline business through software automation and most importantly, enjoy the journey! Most small business owners dread the tax season. Yet to save money, many entrepreneurs attempt filing taxes on their own and end up making costly mistakes in the process. Two recent polls by online small business service directory Manta have found 21 percent of small business owners file taxes on their own, without help from tax software or an accountant. The surveys also found that 30 percent of small business owners are still tracking their expenses with paper receipts, a system that invariably increases the possibilities of making mistakes. 74 percent of small business owners feel confident about their available deductions. 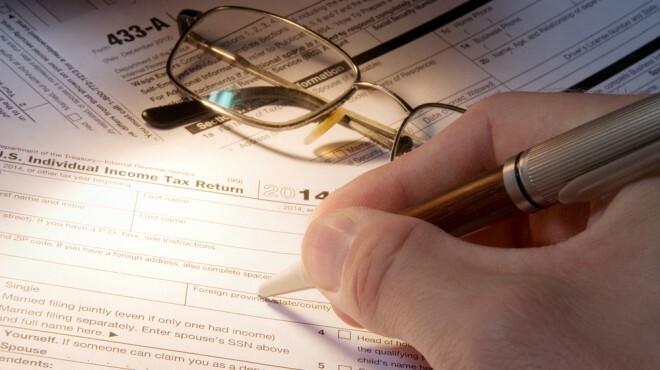 Small businesses have several things to worry about; filing taxes need not be one of them. Thanks to several new user-friendly apps, it is now easier for business owners to simplify the process of filing taxes. “Apps like Expensify are useful because they’re free and can be accessed on the go. Rather than worrying about losing paper receipts, small business owners can simply take a photo of receipts that are then automatically synced with their credit cards,” says Manta CEO John Swanciger. “Even when they’re properly stored and maintained, receipts can easily be lost and this tactic is more prone to human error. Tracking expenses with paper receipts is also a time-consuming process since logging and filing receipts is a tedious task,” he adds. Most of these apps connect business owners to seasoned tax professionals who provide valuable input and answer all questions businesses might have with regards to the process of filing taxes. What’s more, these apps are based on advanced algorithms to ensure businesses make no mistakes when they prepare taxes. As these new apps are more cost-effective and reliable than tax consultants, many small businesses are now using them to make their lives easier. For its tax poll, Manta conducted two online surveys between February 29 and March 2 and March 2 and 3, 2016. About 924 and 600 small business owners participated in the two surveys, respectively. Bulgaria’s energy regulator has endorsed a proposal of state-owned wholesale gas supplier Bulgargaz to cut natural gas price by 23.02% for the second quarter of 2016. The latest cut takes to 48% the drop in gas price since the start of last year, the Energy and Water Regulatory Commission (KEVR) said in a statement on Thursday. The price of natural gas sold to end suppliers by Bulgargaz for the period April – June 2016 has been set at BGN 312.21 per 1,000 cubic metres, free of VAT and excise. Lower gas prices will lead to a drop in the price of central heating. Prices in Sofia will be cut by 5.64%, in Plovdiv – by 0.17%, in Varna – by 4.89%, in Burgas – by 4.33%, in Pleven – by 9.13%. The price of hot water supplied by central heating plants in the cities of Vratsa and Razgrad will drop by more than 11%, KEVR said. Bulgaria’s consolidated budget is expected to show a surplus of BGN 1.86 B as of end-March, equivalent to 2.1% of 2016 GDP forecast, the Finance Ministry has said, citing preliminary estimates. This will compare with budget surplus of BGN 256 M as at end-March 2015 (0.3% of GDP), the Finance Ministry said in a statement on Thursday. Increased tax revenues and grants and decreased expenditure in January-March compared with the same period of 2015 are the main reasons for the rise in budget surplus, according to the ministry. Considerable grants from the EU (BGN 783 M in March) added to increased revenue from taxes and social security contributions to make budget surplus higher, the ministry said. Part of those grants were refunds from the EU for expenditure made at the end of last year, while another part were upfront payments from EU funds for the 2014-2020 programming period. The expected increase in budget surplus for the first quarter should be seen as a guarantee that the budget balance projected for 2016 is achievable rather than a sign of sustained improvement in budget balance, the Finance Ministry said, citing as reasons the specifics of Bulgaria’s tax payments calendar, the one-off nature of some types of budget revenues collected in the first three monts of 2016 as well as the shifting of a considerable portion of investment spending toward the second half of the year. Revenues and grants under the 2016 consolidated budget are expected to total BGN 9.08 B as at end-March 2016, up by BGN 1.29 B from a year earlier and equal to 27.5% of the planned 2016 total. Expenditures, including Bulgaria’s contribution into the EU budget, is estimated at BGN 7.22 B as at end-March, or 20.7% of 2016 plan. By comparison, consolidated budget spending was BGN 7.54 B as at end-March 2015. The Finance Ministry will publish data about consolidated budget revenues and spending as at end-March 2016 at the end of April. Bulgaria consolidated budget has shown a surplus of BGN 915.2 M at the end of February, equivalent to 1.0% of the projected 2016 GDP. This compared with budget deficit of BGN 105.5 M equivalent to 0.1% of GDP at the end of February 2015, the Finance Ministry said in a statement on Thursday. The ministry attributed the turnaround to increased revenues and grants as well as decreased spending in the first two months of 2016 compared with the same period of last year. Bulgaria’s consolidated budget showed a surplus of BGN 991.6 M for end-January equivalent to 1.1% of the projected 2016 GDP. Revenues and grants have increased by 15.9% year-on-year, reaching BGN 5.52 B as of end-February, or 16.7% of the 2016 plan. Tax revenues including social security contributions have increased by 10% on the year in nominal terms, reaching BGN 4.23 B, or 16.3 B of the plan for the year. Revenues from direct taxes totalled BGN 487.5 M for the first two months of 2016, or 10.4% of the plan for the year, increasing by 1.7% in comparison with the same period of 2015. Revenues from indirect taxes totalled BGN 2.52 B as at end-February 2016, up 15.2% from a year earlier and equal to 19% of the 2016 plan. VAT revenue was BGN 1.70 B, or 20.2 % of the planned total for the year. Expenditure under Bulgaria’s consolidated budget, including the country’s contribution into the EU budget, totalled BGN 4.60 B as at end-February 2016, or 13.2% of the total planned for the year. This compared with expenditure of BGN 4.87 B as at end-February 2015, the Finance Ministry said. The government’s fiscal reserve totalled BGN 8.9 B at the end of February 2016, including BGN 6.8 B deposited with Bulgaria’s central bank. If you run a B2B company (i.e., a business that sells to other businesses), have you ever wanted to benchmark your company’s social media efforts? See how you’re doing compared to others? TrackMaven recently conducted a study of B2B brands and their social media activity. The study found that LinkedIn just kills it when it comes to the average number of social media followers among B2B businesses. B2B companies had an impressive 109,000 LinkedIn followers on average. Other social networks didn’t even come close when it came to the average number of social media followers. Facebook came in second with 34,000. Next, after Facebook, was Twitter with a “mere” 18,000 average followers. Instagram and Pinterest brought up the rear. LinkedIn’s huge lead cuts across nearly all industries, according to the study. One notable exception is the computer hardware industry, where it seems Facebook is the social media platform most popular with followers. To some, LinkedIn’s near universal B2B dominance may not be all that surprising. After all, LinkedIn is a social networking platform for business professionals. It stands to reason that if you’re selling products or services to other businesses, you go where the buyers are. What may be surprising is that LinkedIn outpaces other social networks by such a huge margin. Another surprising factor may be that Facebook, with its consumer focus, came in second place. But Facebook’s second place finish may be more a factor of its size, rather than its audience makeup. With Facebook having over a billion monthly active users, lots of business buyers are bound to be among those billion-plus users. The TrackMaven study looked at larger companies, and not small businesses. The data covered 316 large B2B brands for the calendar year 2015, encompassing over 100 million social interactions. 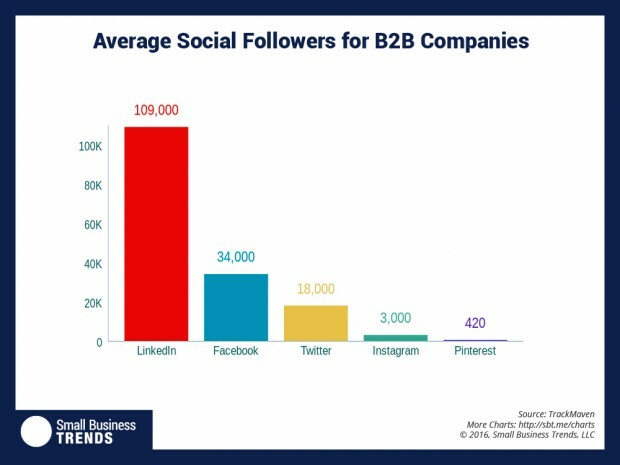 If you’re in B2B, you need to be active on LinkedIn. If you’re not, your competitors probably are. That can put you at a disadvantage. And you could be missing out on an opportunity. One best practice is to focus your efforts on just a few social media platforms for the biggest impact. For most B2B businesses, that means LinkedIn should be at or near the top of your list. Don’t be content with benchmarking against large brands. Conduct your own competitive survey to discover the average number of social media followers in your industry among businesses of your size. It’s not hard and the data is publicly available. Just list your top competitors, find their social media profiles, and tally up their followers on each platform. Calculate the averages. Then see how your business compares. That can give you clues about where you should be placing more — or less — of your attention, especially if you are dissatisfied with your current social media results. The reason may be that you’re looking for love in all the wrong places. What do you make of this data? Which is your best performing platform in terms of number of followers? You are currently browsing the Business, finances, forex blog archives for March, 2016.